B.B. King has replaced Maya Angelou as the Honorary Chairman of the Board of Directors of the Cotton Pickers of America and Sharecroppers Interpretative Center - an effort to build a monument in the Mississippi Delta to honor cotton pickers. Khafre, Inc, based in Indianola, Mississippi, began the effort in 2009 to build the complex to say thanks to those who helped build the cotton empire that fueled the American economy for nearly two centuries., says C. Sade Turnipseed, founder and executive director. The monument will be 25-feet tall and will be located on 20 acres of cotton fields along Highway 61. "The Cotton Pickers Monument Complex would not only help heal wounds that have festered for decades, but would also help to empower the generations of family members who have been negatively impacted by this unfortunate era in American history," Khafre said in a statement. "By embracing the shared history of many races and individuals from different social classes, it is Khafre, Inc's sincerest hope and deeply held conviction that this monument/educational center will help bridge deep racial divisions and distrust through education, outreach and recognition of the strength of the human soul. This is truly a historic endeavor that has the rare opportunity of actually transforming lives, communities, and the conversations about race in America and throughout the world." Khafre, Inc. held weekly sessions throughout this summer to gather memories and oral histories from people with roots in the Delta, especially older African-Americans with first-hand knowledge of work in the cotton fields. If you missed a session, you can add your oral history online here. If you're interested in helping, you can donate here. To support the cause, you can also buy a miniature of the statue and legacy bricks in the plaza. The group is also accepting art, artifacts, or literary works for inclusion in the soon-to-be-released anthology, The Cotton Pickers of America. Frank Gehry's Guggenheim Museum Bilbao in Spain, pictured above, turned a once-obscure port into a destination. And next he's turning his attention to five structures (or "pods") for the Ohr-O'Keefe Museum in Biloxi, which is dedicated to the potter George Ohr. The first phase of the Gehry-designed museum opened in November of 2010 after closing in 2005 due to damages suffered during Hurricane Katrina. It's about two-thirds complete. Hear Frank Gehry talk about his work at the Biloxi museum here. Prior to 1966, if artists wanted to create works larger than their studios or metalworking abilities allowed, they had to turn to industrial manufacturers (usually steel fabricators or boat builders). But the opening that spring of Lippincott, Inc. changed that - and the direction of American art in the process. To serve the growing need for expert fabrication, the Lippincott foundry opened in North Haven, Connecticut, in 1966. Lippincott was an all-in-one sculpture production center that put the tools of industrial fabrication in the hands of artists, allowing them to produce at a scale they had previously only dreamt of on paper. Over the years of the shop's operation from 1966 to 1994, Lippincott, Inc. has produced sculptures by nearly one hundred artists. The shop's founders, Donald Lippincott and Roxanne Everett, meticulously documented the working processes of some of the most important American artists of the twentieth century, including Claes Oldenburg, Louise Nevelson, Ellsworth Kelly, Robert Indiana, and Barnett Newman. Large Scale: Fabricating Sculpture in the 1960s and 1970s presents over 300 photographs of artists and their iconic large-scale works including Newman's Broken Obelisk, Indiana's Love, Oldenburg's Geometric Mouse, and Rosenthal's Alamo, many of which have been previously unseen. Lori Waselchuk for The New York Times/ Rachel Lucas, a design consultant from New York, working on a house created by the artist Wangechi Mutu as an art installation for the Prospect.1 biennial. Prospect.1 New Orleans, a new contemporary art biennial, is set to open in New Orleans on Saturday and continue through Jan. 18. With 81 artists on the roster, it is being billed as the largest exhibition of contemporary art ever held on American soil. 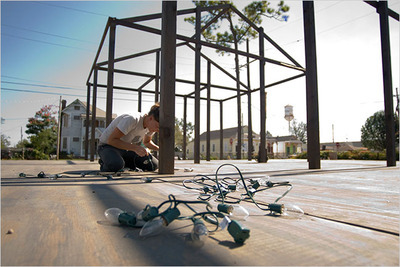 (Nine of the 81 artists taking part in the biennial live in Louisiana.) There are more than 20 biennial sites, which include the Edgar Degas Foundation; the New Orleans African American Museum of Art, Culture and History; the Battle Ground Church; and the Ideal Auto repair shop. Artwork created by individuals who participate in Mississippi State Hospital’s (MSH) Community Services art workshops will be on display at ARTichoke art gallery in Jackson from July 17 until July 30. A reception will be held at ARTichoke, located at 1012 E. Fortification Street, on Thursday, June 24, from 5 p.m. to 8 p.m.
MSH Art Instructor Anthony DiFatta said the exhibit demonstrates to the public what his students are capable of doing. For more information about the exhibit or the reception, call DiFatta at 601-351-8000, ext. 4696. The Walter Anderson Museum of Art recently announced the WAMA Coastal Holiday Card Contest 2008. All artists throughout the Southeast are invited and encouraged to participate. Walter Inglis Anderson had a love for nature that was not only apparent in his day to day life but most certainly in his art. Anderson referred to himself as an artist "more in love with nature than art," and easily portrays his ideals in all of his work. Do you have a favorite memory of holidays on the coast? Perhaps a favorite coastal retreat you call home, joyfully decorated for the season. They want to see your ideas and share them with everyone that walks through the Walter Anderson Museum of Art. 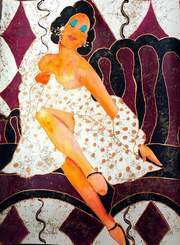 All drawings, paintings (water color, oil, pastels, acrylics, etc.) must be two-dimensional and represent a Coastal Holiday. Photographs will not be accepted. The winning entries of four artists will be selected. The four designs chosen will be sold at the Walter Anderson Museum Store as a collector’s set and a percentage of sales will be shared with each artist. The deadline for entry is July 15, 2008. Artists can get an application online at www.walterandersonmuseum.org or by calling the museum at (228) 872-3164 or by mail to: ATTN: Betsy Myers, The Walter Anderson Museum of Art, 510 Washington Avenue, Ocean Springs, MS 39564. All mail-in entries must include a disc of artist’s work along with completed form. The collectors set will be printed and ready for the Peter Anderson Festival. For more information please contact Betsy Myers at (228) 872-3164. The Greater Jackson Arts Council has issued a call for entries for their August Live and Let Draw Competition: James Bond Invitational. The top prize will win $1,000, with up to $2,100 available for all places. Juried entries will go on display in an exhibition at the Mississippi Arts Center in August and serve as decor for the arts council's annual Storytellers Ball on Aug. 21. The deadline is June 30 for two-dimensional works in the spirit of the James Bond theme. (Entries may have three-dimensional qualities but must hang on the wall for display.) Artists can submit photos, digital prints or digital files (no slides or original artwork). There is a $10 entry fee per piece. The exhibition will be on display Aug. 4-30. An artists reception for the show, 2-4 p.m. Aug. 7, will be open to the public. Awards will be presented then. Ed Moberly has created a kind of folk art museum at his home in the Florida panhandle - but his intricate and fun carvings are not for sale, he says. 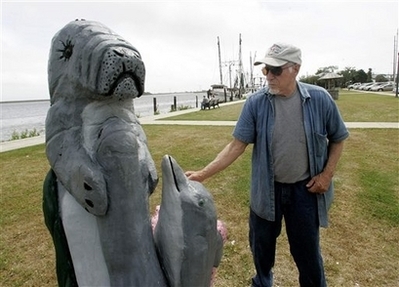 He's a retired insurance adjuster with no art training who just started carving 10 years ago when he moved to Apalachicola.